Gothenburg is Sweden’s second largest city and is situated in the west of the country in the Västra Götaland Region. It is a major port and has grand buildings. 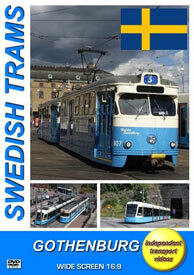 The city has the largest tram network in Northern Europe of which most of it has dedicated rights of way with street running in the city centre. Horse trams first ran in Gothenburg in 1879 and were operated by an English company with the electric trams beginning in 1902. The present day operating company is Göteborgs Spårvägar AB. Västtrafik is the transport authority, which has responsibility for both the buses and the trams in the city. Gothenburg’s trams survived the change in the rule of the road in 1967 along with those in Norrköping. The trams are in a smart sky blue and white livery and the buses mostly wear an over-all mid blue scheme, with some of the older Volvo articulated buses in a similar livery to that of the trams. The tram fleet at the time of filming, which was in June 2016, consisted of Type M28 trams built by ASJL and ASEA between 1965-1967 – the 700 series, M29 trams built by Hägglund between 1969-1972 – the 800 series, M31 trams built by ASEA between 1984-1992, with a low-floor section added – the 300 series and Type M32 ‘Sirio’ trams built by Ansaldobreda between 2006-2013, these being 100% low-floor, and numbered in the 400 series. Our filming begins at Drottningtorget outside the Central Railway station in the city where all types of trams are seen operating as well as the buses, including some three-part articulated Volvo buses. We continue to Norra Hamngatan for more action and then go to film on the Götaälvbron bridge before catching tram 350, a Type M31 for a ride back to the city centre on Line 5 over the bridge. Here we board another Type M31 tram, this time number 360 also on Line 5 for a ride to the busy Korsvägen interchange. After intense filming here we travel on 803+859, which are M29 type trams on Line 2 to Mölndal. We then return to Korsvägen to connect with Line 6 and board 745+730, ASJL Type M28 trams, to Chalmers travelling through the 1050m Chalmers tunnel, which was completed in 2002. At Chalmers we record the movements of the trams and buses before boarding Ansaldobreda ‘Sirio’ Type M32 tram, 411 on Line 8 to Marklandsgaten. Again another busy interchange for you to enjoy the action! With our filming complete here, we board 840+734 a Hägglund Type M29 tram and ASJL Type M28 tram set on Line 3 to Järntorget. At this interchange we ride on low-floor tram 443 on Line 9 to Drottningtorget and get the drivers eye view as we travel along the waterside heading towards the Central Railway station where we get a superb view of this lovely city. Further filming is completed in the city centre at various locations including Skånegaten, Stampgatan, Östra Hamngatan and Kungsportsplatsen. From here we board 849+704 another Type M29 and M28 combination and travel on Line 3 to Olskrokstrget to complete our filming. Here we see the trams running out to this pleasant suburb at the end of the evening rush. We hope that you have enjoyed your journeys around Sweden’s second city as much as we did filming it for you!